If you’ve been watching Girls like I told you to, then you’ve probably been rocking out to this song for at least two weeks now. Me? Well, I don’t actually get HBO. So, I have to wait until I can find alternative means to watching it, which means I was about a week or two behind in hearing this song and loving it. oh, what’s this? You came to this vegan blog for recipes?! Sorry! I was distracted by the fact that it’s Friday, which has put me in a dancing mood. Preheat over to 350 degrees F. Coat a large skillet with cooking spray. Coat a 13 x 9 x 2 inch baking dish with cooking spray. Add vegan ground beef to skillet and cook over medium high heat until heated through, about 5 minutes. Add the beans, 1 3/4 cups of salsa, chili peppers, chili powder and scallions. Cook until heated through, about 3 minutes, stir in cheese. Meanwhile, wrap tortillas in foil; warm in oven for 10 minutes. 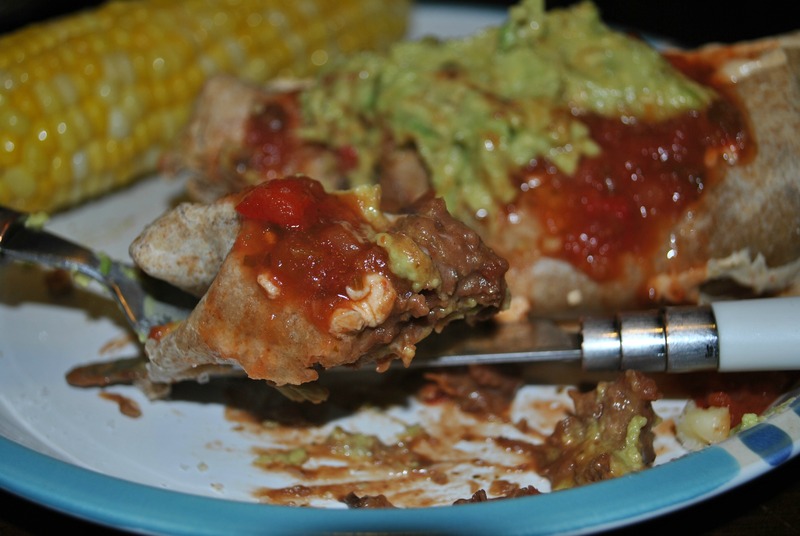 Assemble chimichangas by spooning about 1/2 cup of filling onto each tortilla; fold in sides and roll up. 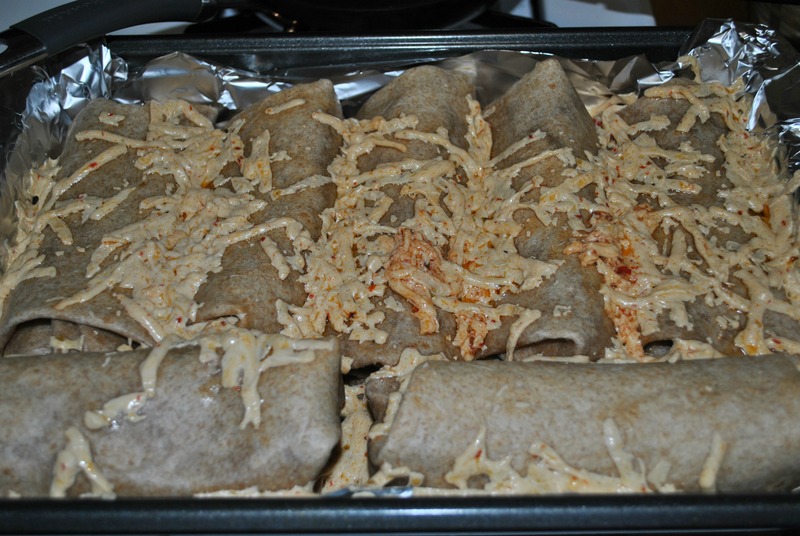 Place each chimichanga, seam-side down, in prepared dish. Bake uncovered, until tortillas are crisp and brown, about 20 minutes. Serve each topped with salsa and guacamole/vegan sour cream. 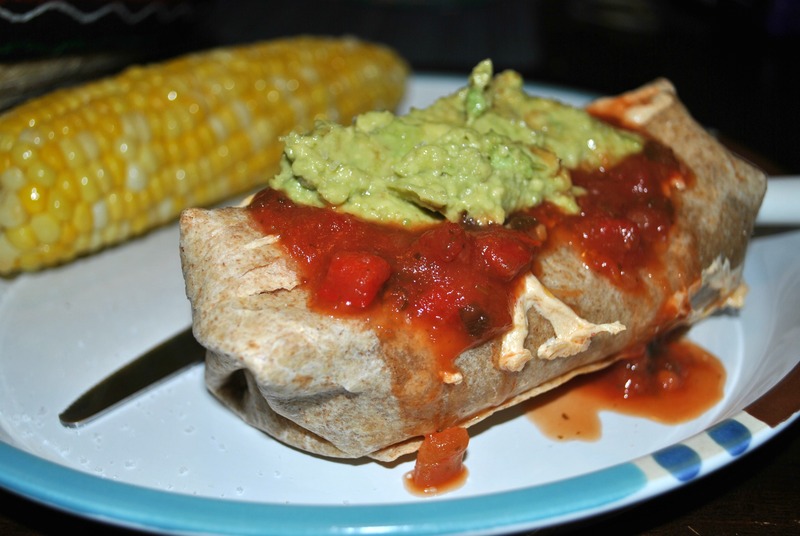 After trying to take a staged photo of refried bean-filled burritos and attempting to make them look appetizing I realized 1. the Weight Watchers ones were most likely chilled, pressed, cut and then photographed to make them less gooey and 2. it wasn’t going to happen on this blog. All my pics come out looking like mush. I tried my best, readers. Just trust me when I say they are easy, delicious and filling! Now if you don’t mind, I have to go find my hairbrush and rock out/lipsynch to this song for the 800th time while attempting not to mess up my freshly painted toe nails. HAPPY FRIDAY! I can’t wait to make these! Yum!